6 Things The IT Support Tech Does that the Boss Needs to Know About! Do you have written network documentation about your computer network? What software licenses do you own, where are the software license keys stored? What are the critical administrator passwords to your systems and devices and who knows them? How is your computer network structured? Is there a current drawing? What hardware do you own and when do your equipment warranties expire? Are there cloud vendors for email, online data backup storage, hosted line of business applications, etc. that you don't currently have, who has access? Who is listed as the technical contact for your company domain name? You should NEVER allow a single IT person or IT company hold this information under their full control over you and your company. If they suddenly left for any reason, this could lead to huge negative consequences for your company. Do you know where your backup files are stored and if they are being stored properly? If you are like most business owners, you're too busy dealing with the "crisis of the day" to think about system backups and probably leave tasks to your IT support expert. If your database gets fried and your tech is nowhere to be found, you might be in a lot of trouble. If there was a data disaster do you know how long it would take to restore your key company applications? Are your employees trained to continue to work without access to the core company applications? Do you have a written plan for restoring your network fast in the case of a disaster? If you don't have a fully tested disaster recovery plan for your office, you could be at serious risk without knowing it until something happens. You should have a written game plan to account for a power failure, a water leak and flood, and a fire? Creating a business continuity plan can save you in the time of crisis. Do you know where all of your software is stored? Bad things can and do happen to computers and servers, and the situation can be made worse if you are not prepared. Taking a minute to organize and store your software in a secure place can save you a considerable chunk of money in the event that you need to restore a program on your systems. If you don't have access to the software or don't know where it is located, you might be forced to buy the software again. You should download your important software and burn it onto DVD disks so you don’t even need the Internet to get an application back up and running. Do you know what routine maintenance is being done on your network? I know that the very idea of learning about and keeping track of all the servers, workstations, and peripherals on your network is about as welcome as a black cat crossing your path, but it is important information to maintain. If your in-house IT expert leaves, who will take over? What are the daily, weekly and monthly processes they are performing on the IT infrastructure? This work should be documented by your IT employee through writing an “IT run book”, then reviewed and discussed with you or their manager. Do you know how to protect yourself from an ugly security breach if your in-house computer expert leaves? What happens if your company’s in-house IT expert splits with no warning and has access to your company's network? As soon as humanly possible, you should disable his or her access, including remote access to your network and all cloud based application. Do you know how to do this or does someone else in your company know how to disable their VPN access and remove their Active Directory credentials? So how did you do? If you answered "No," to even one of these questions, you need to get help now before it's too late. During this month I will help you go from answering “No,” to getting a “Yes,” for every question. I will teach you how to do any of these items for free! ANP is offering a free IT Network Assessment this month to companies with greater than 30 PCs. Follow this link and register for your free IT Network Assessment. 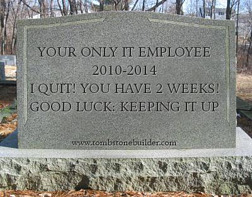 Please don't let your IT employees' two week notice scare you to death!